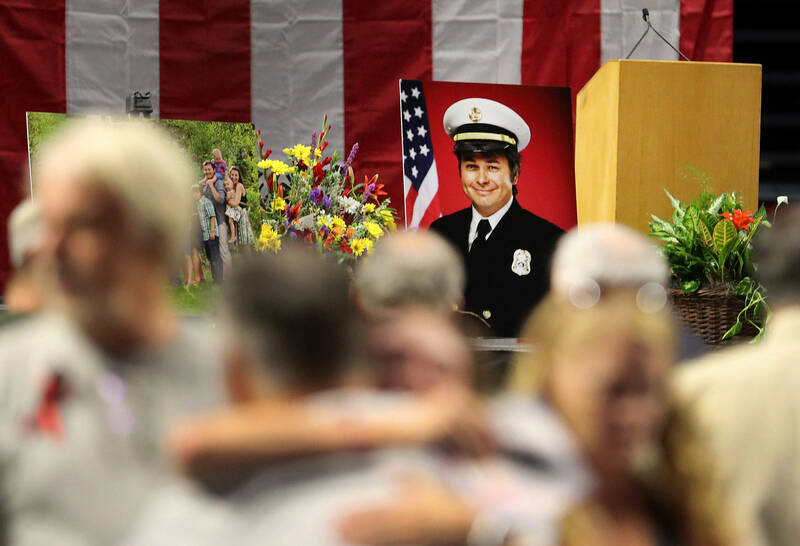 SACRAMENTO — A firefighter died last week from falling tree debris after thousands of gallons of retardant were dropped on the area where he was helping battle California's largest-ever wildfire, according to a preliminary report from investigators. The summary report from Cal Fire says Battalion Chief Matthew Burchett was struck by debris on Aug. 13 at the Mendocino Complex Fire. Three other firefighters suffered minor injuries. 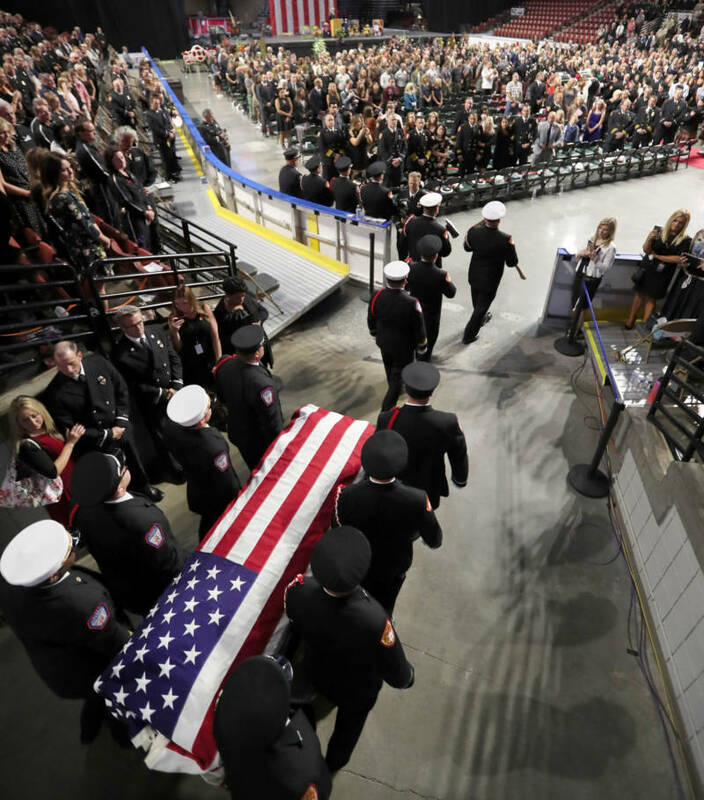 Funeral services for the 42-year-old Burchett were held Monday in his home state of Utah. Friends and family said Burchett thrived when he was sleeping on the ground, eating rations and working to protect people. He was described as a sharp, hardworking leader with a well-known grin and unassuming manner. He is survived by his wife Heather and 7-year-old son Griffin, who carried his father's helmet underneath his arm as he entered the funeral. Cal Fire's preliminary summary report on the incident recommends an immediate corrective action, saying firefighters must remain clear of areas with overhead hazards during a retardant drop. "That is what we're trained to do," said Scott McLean, a spokesman for Cal Fire. "Look up, look down, look around." He and other spokesmen could not say what went wrong in this case, citing the ongoing investigation. That includes disclosing the type of aircraft involved, why the four firefighters were underneath, or even if all four firefighters were from the same unit. Cliff Allen, president of the union representing state wildland firefighters, said he understood investigators were still conducting interviews. But he said fire supervisors should have made sure the firefighters were well clear of the drop zone, or that their positions were clearly marked for the air tanker pilot and the pilot of the lead planes that guide in the huge tanker aircraft, showing them where to go and when to start and stop slurry drops. There could have been a radio miscommunication or the crew may not have heard or chose to ignore the radio warning, Allen said. He cautioned that it's not clear from the preliminary report whether the tree was weakened from the fire or from the retardant drop, or if the firefighters were hit by fire retardant slurry, which is a mixture of water, fertilizer and red dye. 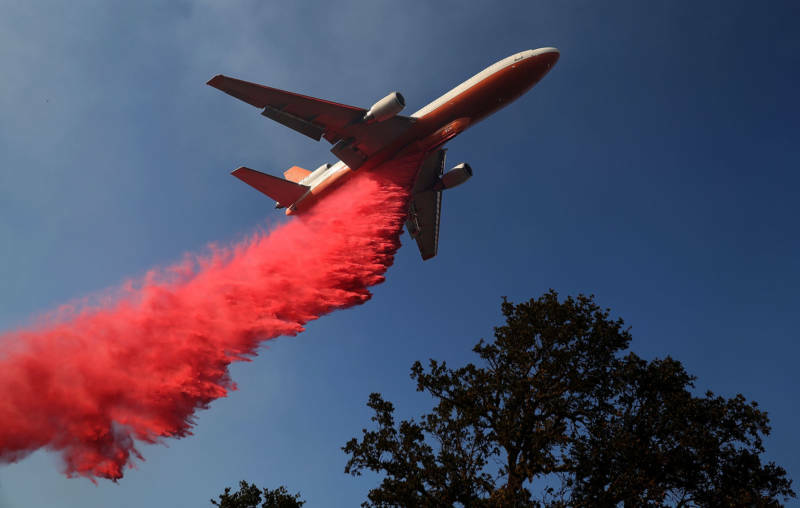 Modified DC-10 aircraft can drop 12,000 gallons of slurry, 12 times the amount carried by the standard smaller air tanker used by Cal Fire. It can lay a swath of fire retardant as wide as a football field for as long as a mile. Cal Fire says a modified 747 can drop 24,000 gallons -- double that of the DC-10. It uses a system that can release the slurry under pressure or as gently as falling rain from an altitude as low as 400 feet. Firefighters who can't get out of the way are trained to lie face-down toward the oncoming aircraft, helmet on, chinstrap secured, one hand holding the top of the helmet as it takes the brunt of the impact, McLean said.